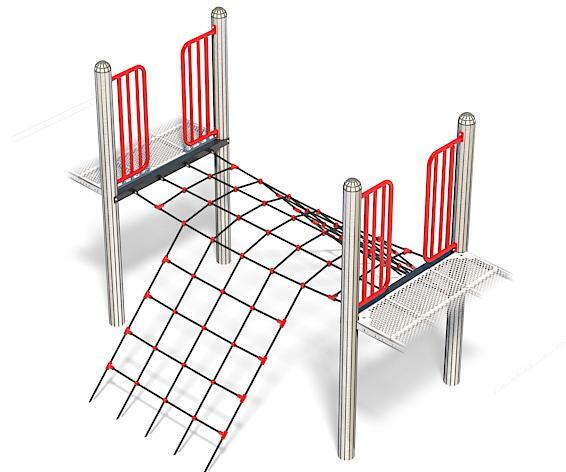 A two sided climbing net that can be accessed from the deck or the ground. Children can climb the net or traverse across it between the decks. Cargo Net Bridge is a mechanical assembly of net, climber base, ground legs, and safety railings. Net is 0.625” (16mm) O.D. steel strand fibre-core polycable with polyfix x-joint, t-joint and polyfix standard ferrule and 0.25” x 1.5” (6mm x 38mm) zinc-plated hot-rolled mild flat steel mounting brackets. Climber base is a welded assembly of 1.66” (42mm) x 11 gauge (3mm) Allied Flo-Coat® galvanized steel tube, 0.25” x 1.5” (6mm x 38mm) zinc-plated hot-rolled mild flat steel, and 0.375” (10mm) O.D. hot-rolled steel bar. Ground legs are 1.315” (33mm) O.D. x 12 gauge (3mm) Allied Flo-Coat® galvanized steel tube. Safety rails are a welded assembly of 1.315” (33mm) O.D. x 12 gauge (3mm) Allied Flo-Coat® galvanized steel tube, 1.029” (26mm) O.D. x 14 gauge (2mm) Allied Flo-Coat® galvanized steel tube, and 0.1875” x 1.75” (5mm x 44mm) zinc-plated hot-rolled mild flat steel. Entire assembly is powder-coat painted.